The new home was built in an existing neighborhood, and the jobsite was small. Also, the crew had to account for several electrical wires and other houses next to the site. 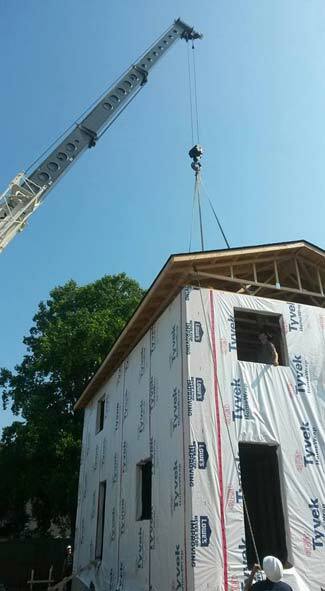 To make sure the lift was successful, Habitat for Humanity involved BNC Crane's team in the planning stages of the construction process. The job required BNC Crane to lift an 8,000-lb roof, with a radius of 55 ft, two stories high for workers to secure it to the home. To perform the lift, BNC Crane chose the Terex T 560-1 crane because of its precision handling ability to be quickly positioned and rigged on the jobsite. BNC Cranes purchased the T 560-1 truck crane in March, 2015, from Cropac Equipment, a Terex Cranes distributor with locations in Oakville, Ontario; Laval, Québec; and Nisku, Alberta. “We’ve worked with BNC Crane for a long time,” says Dan Sweeney, sales representative at Cropac Equipment. “They work hard and are well-respected in the area. When they were in the market to upgrade their equipment fleet, they did their homework. Brad (Moore) knew exactly what he wanted in a crane. And, the T 560-1 was the perfect unit for their needs.” Since BNC Crane operates in a rural area, travel speeds are important to them. With travel speeds of up to 65 mph, the T 560-1 crane met those requirements and comes equipped with an air-ride suspension for smooth travel even on rough terrain.